Researchers are exploring new ways to create nanoparticles that can target specific receptors on cancer cells and deliver drugs. This image shows magnetic iron nanoparticles that target cells with IGF-1R receptors, and are conjugated to a chemotherapy drug (dark blue). 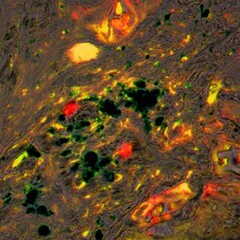 In the tumor stroma of a mouse model of pancreatic cancer, the nanoparticles delivered the chemotherapy to tumor-associated macrophages expressing IGF-1R (red) and CD68 (green). These magnetic iron nanoparticles are theranostic – capable of both diagnostic and therapeutic functions.